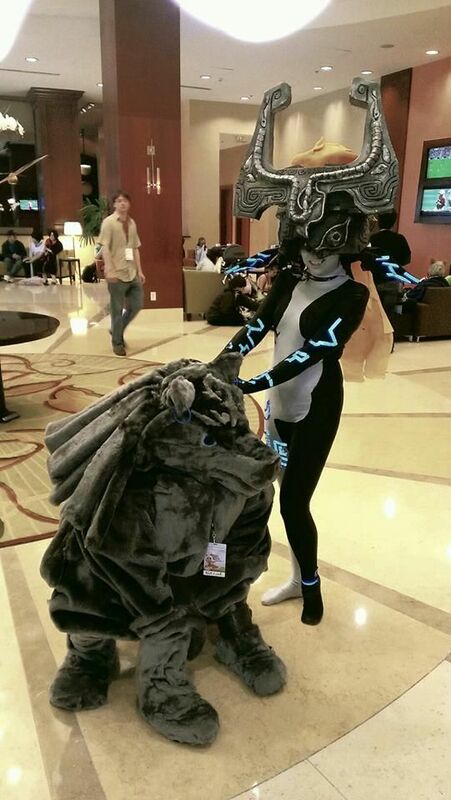 Cursed Midna Cosplay « Adafruit Industries – Makers, hackers, artists, designers and engineers! I dyed the suit overall a very pale shade of light blue using poly idye. This stuff can be tricky, and dying polyester usually takes a little bit of time. Read the directions carefully. RIT dyes would probably also work. 7 pots of black fabric ink – heat-setting and opaque, but not thick. If I redo the suit, I may just go with regular fabric paint, but I wanted the body suit to look dyed rather than having a thicker paint layer. I found mine at Jerry’s Art-O-Rama for about $3 a pot. The prep work for the suit involved me removing the dress form from the stand, wrapping the whole thing in plastic wrap, and then sliding the suit onto the dress form. It made it easier to figure out how to make the lines, and easier to actually paint. Let the suit dry on the dress form, and you can heat set it on the dress form as well.